‘Britain is no longer what it was’. This is a common refrain in the corporate media whitewashing Britain’s profoundly virulent role in the world at large. Rather than ‘losing’ an empire, Britain has in fact adapted to a new order in which, admittedly, it is no longer top dog, but nevertheless still has the capacity to unleash mass terror and inflict misery. Private security companies provide the means for the British ruling class to do this without recourse to their own state military. This offers the advantage of being able to operate in areas more anonymously, and operating with even less oversight than a national force carries, which allows the wanton application of cruel and inhumane approaches. Global private security is a £140bn industry and rising. It employs in excess of 15 million people. The British state has played a pivotal role in its expansion, according to The Guardian it is the ‘mercenary kingpin’ of the world[i] – 14 separate companies are based in Hereford, the SAS HQ, all the better to recruit British soldiers. There’s a lot of talk about our poor ex-servicemen, abandoned, living on the streets of Britain, losing out to undeserving recipients of British beneficence: asylum seekers. However, what of the vast numbers who go on to make a pretty penny as mercenaries, ‘dogs of war’, at the beck and call (now directly) of Big Capital. At the height of the occupation of Iraq about 80 British companies operated there. Hundreds operate globally with no democratic oversight. Last year there were contracts of £188m (to protect Basrah Gas Company) up for grabs and a five year £100m contract with the British embassy in Afghanistan. There’s big money to be had: the Labour government spent over £60m on such contracts between 2007 and 2009[ii]. And most of it goes to ArmorGroup. ArmorGroup is owned by G4S (bought in 2008 for $85m). G4S is the third largest private employer in the world, after Walmart and Foxconn, with well over 600,000 employees on six continents, and a military force triple the size of the British Army. In 2013 their turnover was £7.4bn, with £2bn worth of contracts coming from the British government – the same year G4S paid £0.00 tax in the UK; the same as in previous years. British governments have not been put off by negative reports on G4S/ArmorGroup from authorities such as the US Senate and a UN watchdog (2010, 2012 respectively). ArmorGroup was alleged by the US Senate to rely ‘on a series of warlords to provide armed men’, yet, unperturbed, Britain extended their contracts in Afghanistan to the tune of £72m. British governments have been shrinking their military forces, from over 100,000 in 2010 to just over 80,000 in 2015, but the consequence is far from a reduction in aggressive imperialism. In fact, it continues the privatisation of military forces which benefits private armies like that of G4S. The dangers should be obvious, but one example is G4S’s recruitment process, which turns a blind eye to criminal convictions and a propensity for brutality. In 2009 former British paratrooper Daniel Fitzsimons killed two colleagues (a Scot and an Australian) and wounded a local Iraqi man in Baghdad’s Green Zone, the day after being issued with a weapon. Fitzsimons had a criminal record, including firearm and assault convictions, was suffering from Post-Traumatic Stress Disorder, and worst of all, G4S had been sent numerous emails warning that handing a weapon to this man would put lives at risk[iii]. G4S now has ordnance management operations in 26 countries. It provides security for global corporations, making it all the easier for them to extract resources and breath-taking profits from oppressed nations. It thrives on conflict and social instability, turning over £500m alone in Africa, where companies such as Shell Oil and AngloGold Ashanti pay handsomely for their services[iv]. Chevron (a US energy corporation) decided to utilise G4S in Nigeria after 600 women successfully occupied a refinery in 2002. Since then, they’ve been helping Chevron maximise their extraction of oil while it dumps pollution on locals and bribes state officials. G4S has the task of keeping the locals intimidated and hesitant to fight back, with fast-response patrol boats mounted with machine-guns[v]. G4S entered the occupied Palestinian territories in 2002 on behalf of Israel, employing 8,000 staff there. They provide security for the apartheid wall, security and scanning for checkpoints in the West Bank and Gaza, and protect settler businesses such as supermarkets. They imprison Palestinians transferred from the West Bank and Gaza (violating the Fourth Geneva Convention), imprison children, detain without trial and perpetrate torture. There are about 4,500 Palestinian political prisoners being detained, including 177 children. In January 2012 The Guardian reported that Cell 36 of Al-Jalameh prison in Haifa is one of the cells where Palestinian children are locked in solitary confinement for days and even weeks[vi]. In 2014 Desmond Tutu joined a demonstration at G4S’s annual general meeting in London, following an open letter signed by Tutu, Ken Loach, Noam Chomsky et al condemning their role in Israel. Such pressure has been shown to work elsewhere: less than three months after securing a £70m contract to service America’s Guantanamo Bay base (where, as of April 2016, 80 prisoners remain detained without any due process), G4S sold the subsidiary tasked with serving the contract. G4S have now announced that they will be pulling out of Israel within two years. Once again, showing the power of campaigning; Boycott, Divest, Sanctions activists persuaded various universities to drop G4S, and G4S’s annual general meetings have been beset by demonstrations for several years[vii]. No wonder the Israeli government has been putting as much pressure as possible on British political parties to weaken the BDS campaign: because it’s working. In 2000 G4S won a 25 year contract to run a private prison in South Africa. G4S managers were accused of forcing black employees to use separate toilets ‘while white guards are given keys to the company toilet. And black G4S guards at Johannesburg airport complain that white supervisors call them “kaffirs” and “monkeys”’[viii]. Ruth Hopkins of the Wits Justice Project has tirelessly investigated G4S’s mismanagement of the Manguang prison, just outside of Bloemfontein. 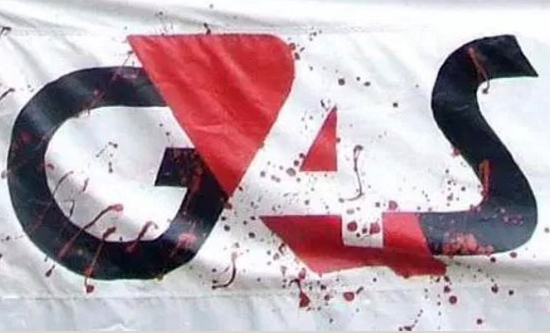 Forty three prisoners have lodged legal claims against G4S through a British law firm. Inmates have complained about serious injuries such as broken limbs and blood in their urine, about being electrocuted into unconsciousness (you can watch leaked footage of electrified shields clicking and inmates’ howls of agony, shouting to stop, guards responding ‘I am doing my job’[ix]), and several inmates have died under suspicious circumstances. Meanwhile, warders admitted administering forced injections up to five times a week (this is highly illegal), one of them explained ‘we want them to be afraid of us, because we are few’[x]. Thus prioritising profit (hiring fewer staff) leads to increased brutality. Despite being aware of G4S’s ‘substandard’ record-keeping of deaths, and the probability it was covering up torture and killing, the South African government took control for less than a year (September 2013 to August 2014) before handing it back again to G4S. This action was taken, not because of G4S’s human rights abuses, but because they had sacked 330 guards who went on strike, letting the prison descend into chaos[xi]. In the winter of 2005 a prisoner, Isaac Nelani, requested an extra blanket to keep out the cold. Another inmate witnessed six members of the emergency security team (aka ‘the Ninjas’) armed with electrified shields go in and order him to strip. They made him take a shower and get dressed. One guard confessed to the BBC in 2013 the common practice of stripping ‘them naked and we throw water so the electricity can work nicely. I will shock him until he tells the truth that I want even if it’s a lie’. 13 other guards confirmed this was common practice. An inmate then witnessed how ‘the EST guys surrounded him outside the cell, cuffed him and started to shock him with their shields. They kicked him too. Nelani was bleeding from the mouth and screaming; we could all hear him’. The inmate witnessed Nelani face down on the floor when a doctor injected his neck. Another inmate found Nelani with his hands cuffed behind his back, and after shaking the body for signs of life, alerted others. Senior managers arrived and entered the cell which Nelani was in. When they came out, the inmate noticed one of them wearing rubber gloves, leaving behind them Nelani hanging from the door, handcuffs removed. The state pathologist, Robert Gene Brook, qualified it as ‘undetermined, but suspicious’ due to bruising on the heart from a massive impact, like severe assault. G4S registered the death as suicide[xii].